Anna Bolton | Greene County News Xenia’s John Sale Manor residents open a 10-year-old time capsule Nov. 26. Soon they will create a new time capsule and bury it behind the apartment complex for another 10 years. 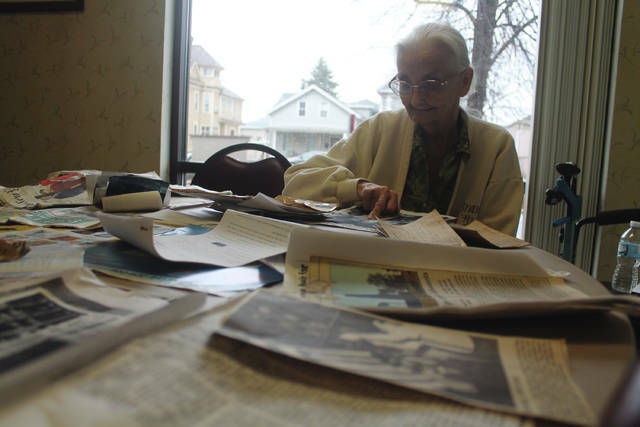 Resident Doris Metz points at a photo in an old newspaper article. Metz said she remembers adding a different news article to the time capsule 10 years ago. Mary Dowler, after opening the time capsule, sorts through photos, letters and reads each newspaper article. Dowler was a John Sale Manor resident when the time capsule was buried. 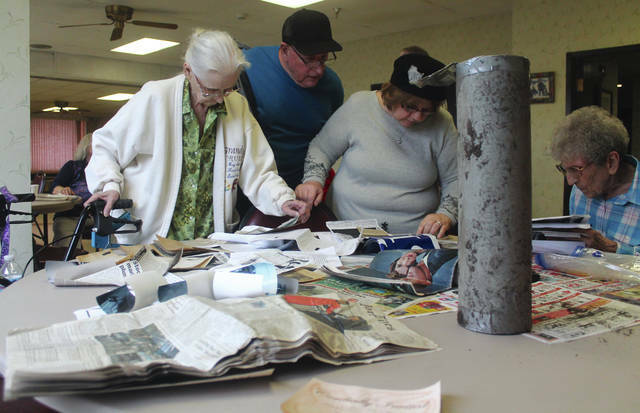 XENIA — John Sale Manor resident Mary Dowler put a few items in the time capsule, which was buried at the apartment complex 10 years ago this week. 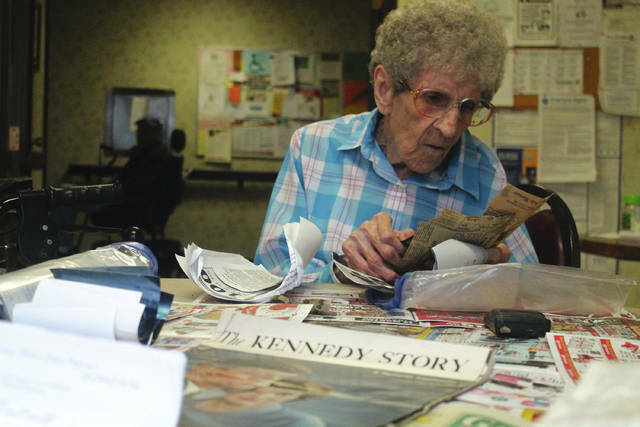 She opened the time capsule Nov. 26 to touch her items again — a copy of “The Kennedy Story,” a 1963 memorial supplement of The Philadelphia Enquirer, as well as photos of the apartment’s parking lot buried under a big snow in 2003. “They took trucks and hauled it away,” Dowler said of the piles of snow. She’s been a resident at the Xenia apartment complex for 34 years. Plastic-bag-wrapped items retrieved from the time capsule span decades, encompassing history of both John Sale Manor and Xenia. According to a Gazette article published at the time of the burial, resident Penny Randall contributed the original, three-page letter she wrote the night of the April 3, 1974 tornado. Dowler pulled out that letter. Another resident, a cancer survivor, had included articles on cancer treatments. Dowler also pulled out an Ohio quarter, photos of the Methodist church which had occupied the site of the apartments, an Obama yard sign and war ration cards. At one point, Sandy Miller, who coordinated the activity, found a black plastic flip phone, held it in the air and laughed. Miller said the residents will gather items to place in another time capsule. They’ll bury it in the back of the complex near the flower gardens after the first day of the new year. “Everyone can put in something that they want,” Miller said to the residents, who gathered around the table for the opening of the slightly-dirty silver cylinder. A few residents already had their items ready for the next time capsule. Miller said she’d be sure to leave instructions for someone to dig it up in 2029.
https://www.xeniagazette.com/wp-content/uploads/sites/32/2018/11/web1_TimeCapsule1.jpgAnna Bolton | Greene County News Xenia’s John Sale Manor residents open a 10-year-old time capsule Nov. 26. Soon they will create a new time capsule and bury it behind the apartment complex for another 10 years. https://www.xeniagazette.com/wp-content/uploads/sites/32/2018/11/web1_Doris.jpgResident Doris Metz points at a photo in an old newspaper article. Metz said she remembers adding a different news article to the time capsule 10 years ago. https://www.xeniagazette.com/wp-content/uploads/sites/32/2018/11/web1_Mary.jpgMary Dowler, after opening the time capsule, sorts through photos, letters and reads each newspaper article. Dowler was a John Sale Manor resident when the time capsule was buried.